The question was addressed to Baskar Ganapathy, co-founder and product head of Numberz. It’s an early stage fintech startup with a software product to help small businesses manage their invoices and cash flow. What makes it different is an add-on feature that lets businesses get a credit line and working capital loans. Baskar explained that managing accounts gave Numberz the credit profile of a business, which made it easier to provide loans. What’s more, businesses can not only get loans for themselves through Numberz, but prompt their clients to use it too. It has a GetFinance button to send with an invoice to clients who may need loans to pay their dues. The problem arises in pitching the product. Accounting tools are many, but a financing avenue through an accounting software product is unusual. Shouldn’t this be the highlight instead of an add-on? Hence the question to Baskar on how he was positioning the startup. The question came from Suresh Sambandam, founder and CEO of Kissflow, one of India’s SaaS success stories from Chennai. It provides workflow automation software on the cloud to over 10,000 companies around the world. 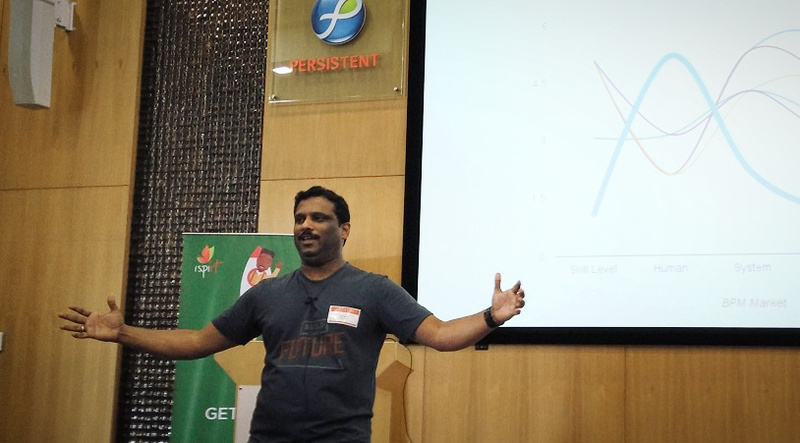 Suresh knows a thing or two about being razor-focused in pitching a software product. Don’t tell me anything more about your product other than how it is going to solve the client’s problem. A word to the wise is sufficient. Baskar and his co-founder at Numberz, Aditya Tulsian, both worked at Intuit earlier. They led campaigns for adoption of Intuit products like Quickbooks for accountants, and saw a gap in getting small businesses to use accounting software. So the Numberz cashflow management product was a natural extension of what they had done earlier. Now the interaction with Suresh gave them food for thought on positioning their unique financing product for small businesses. 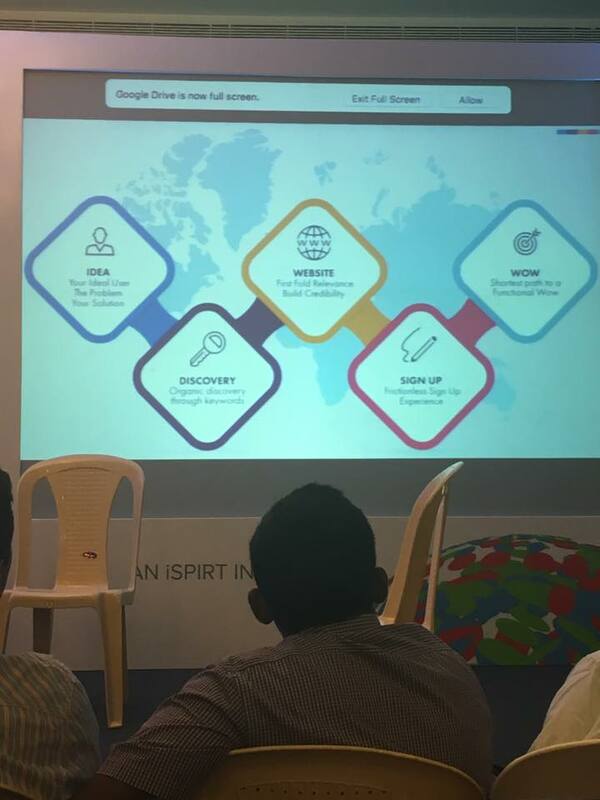 The interaction happened at a bootcamp in Pune organized by non-profit think tank iSPIRT (Indian Software Product Industry Round-Table), whose mission is to transform India from a back office for software services to an innovation hub for software products. 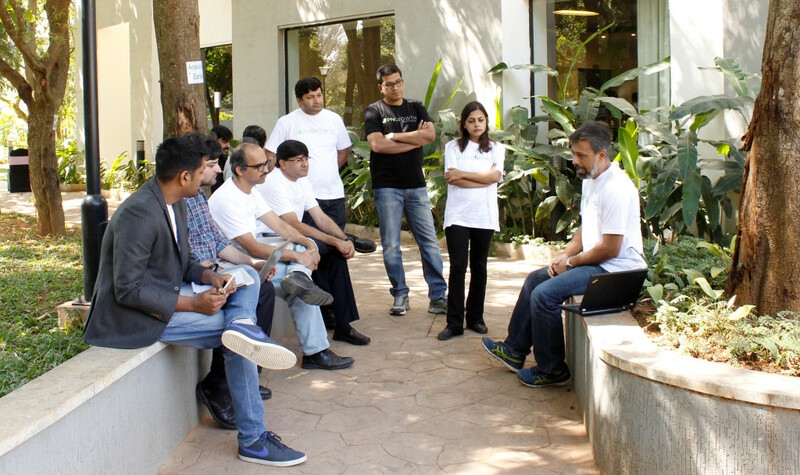 This was the second in Pune aimed at helping early stage startups looking for product-market fit. ISPIRT holds a similar bootcamp for growth stage companies in Mysore. The bootcamps have a product teardown format for experts to coach startups. Places like Pune and Mysore are emerging startup hubs which lack the abundance of role models and mentors in India’s Silicon Valley, Bangalore, or its SaaS capital, Chennai. 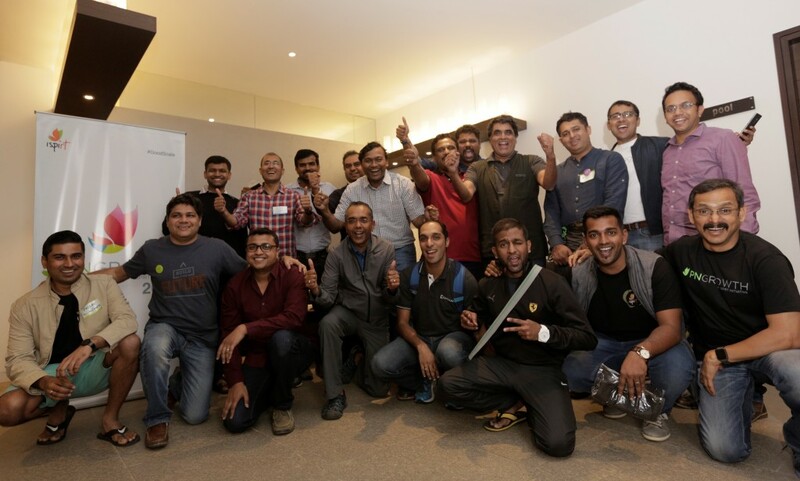 Seasoned entrepreneurs and mentors from the bigger hubs of Delhi, Bangalore, and Chennai had day-long interactions with startups who had signed up for the bootcamp in Pune. iSPIRT arranged for a round table on this topic there was a buzzing interest. Suresh of kissflow.com who has been successful in cracking the US market with his DIY Self-service workflow product conducted this round table. What was interesting is when the group was setting an agenda. It sort of covered areas from the complete funnel from marketing to Sales. Here are the sections and key learnings that were discussed in each. End of the article we also have links to tools and resources that can help. These might also be leads that you have gathered by list building/event which you might be nurturing through email marketing or Inside Sales for outbound. Data for outbound prospecting is very important; Mass Emailing does work but it is super important to spend time on defining segment well and crafting messaging which is relevant. Should you have a product specialist closing or Account executive? If you selling 50K + ACV then a field Sales or experienced AE in the US is recommended. It was recommended that if you are starting out get someone who is more experienced and can then train new members. Training was an important aspect of Inside Sales and once you have 2-3 members it’s best to invest into training. One of the learning I have had is that the player coach model does not work. If you are getting someone to manage / coach a team do not have a individual quota for them. SDRs should be compensated and evaluated on meetings / opportunities passed and accepted. The sea breeze was cool. And the SaaSy people went cool as well. 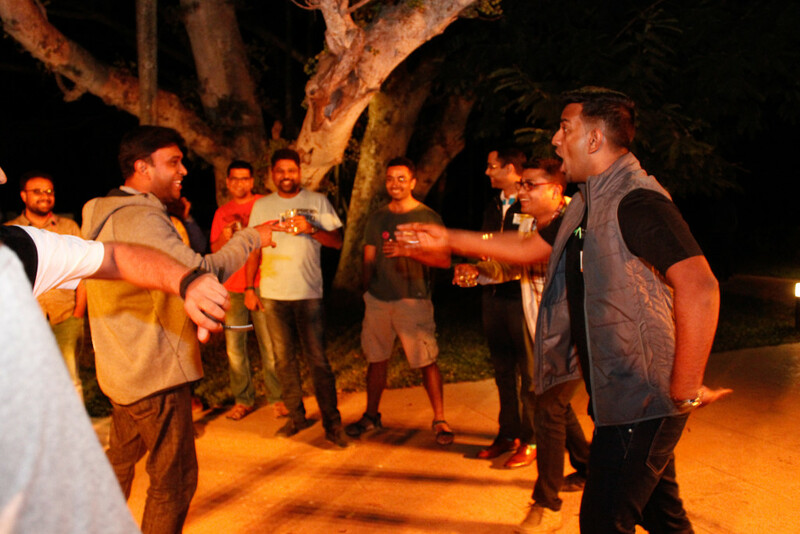 Kiruba unleashed some tricks for networking that had the participants engaging in banter, fun and games on the lawn. It also wore off the participants from postprandial somnolence (carb coma) after lunch. The SaaSy bus by then had arrived from Bengaluru, and the participant number swelled to 150 or so. Pallav Nadhani set the theme for #OneThing discussion involving of Siddharth of Practo, Nemesh of Appointy, and Ankit of AdPushup. He cited examples of MailChimp, which sends annual reports about the number of mails sent through its service, and Rancore, a research organisation that sent reports about Share Point, a Microsoft product for developers. He said that research reports set benchmarks for what works. He spoke of referral marketing and commission paid on referrals to existing customers as strategies to acquire customers without much of a marketing spend. Avlesh of WebEngage said that marketing does not exist in silos away the product. He spoke of incorporating the marketing element inside the product itself. One strategy is using the “powered by *product logo*” inside the product to attract more prospects. This was especially used in a novel way. WebEngage chose a customer (of course, after a due diligence) to sell its low-priced product in an unpresent geography. Then the logo was added in the product to attract more customers in the region. The customer acquisition cost is reduced as a result. Nemesh of Appointy (which helps businesses to schedule appointments) has 118,000 customers, all of them acquired at zero cost of marketing. This was done through backlinks (two lines of codes in the product), which would indirectly show up in the Google search when someone searched for a tool for appointments. Ankit spoke of four strategies to customer acquisition without much marketing spend. Mohan from Norwest said the SaaS multiples have compressed in the United States – it’s five times the revenue now rather than the 10x number that was the norm until sometime ago. He also said that SaaS companies have a history of not making a profit but was confident that it is possible to build a profitable SaaS company in India, which is capital-efficient. Tarun of Matrix Partners clarified that now the focus has shifted to profitability of SaaS companies rather than growth. He said that growth expectations are tempered according to existing market conditions. Now, liquid capital is not available easily. He agreed that there was a time when growth was the focus when the capital was easily available. Now that capital has shrunk, it’s difficult to have a growth at the cost of profit strategy but the one focused on profits is the best. Frictionless sign-up, a clutter-free website and a shortest path to functional wow! are some of the elements of the SaaS product that is self-serving and sold to remote customers. Three products were at the receiving end … er … learning end from Suresh Sambandam of KissFlow, Bharat, head of UX at Freshdesk, and Shekar Kirani of Accel. While Suresh focused on the sign-up aspects, Bharat gave feedback on design whereas Shekar pinpointed the market focus. Zipboard, Hummingbill and Canvas Flip were the three products that were reviewed on stage. This was easily the most popular segment of the day. There was laughter, there were learnings, there were moments of revelation, and on top of it, the three products wouldn’t have received such an honest feedback elsewhere. Shekar’s advice was worth a weight in gold especially for Zipboard and CanvasFlip. He was laser sharp in identifying the right customer segment and market and the entrepreneurs in the audience were overawed by his clarity. The audience felt that Product Teardown deserves to be expanded in future editions of SaaSx. Peer feedback is valuable and helps to refine the product to make it efficient to acquire more customers. The grand finale of the day was Girish making a fantastic presentation on his journey – from $1 million to $5 million. At each stage in the presentation, he called in the team members who worked on identifying a specific problem and explained what worked and what didn’t. What came through was the endeavour that propelled everyone at Freshdesk to work towards a common goal. 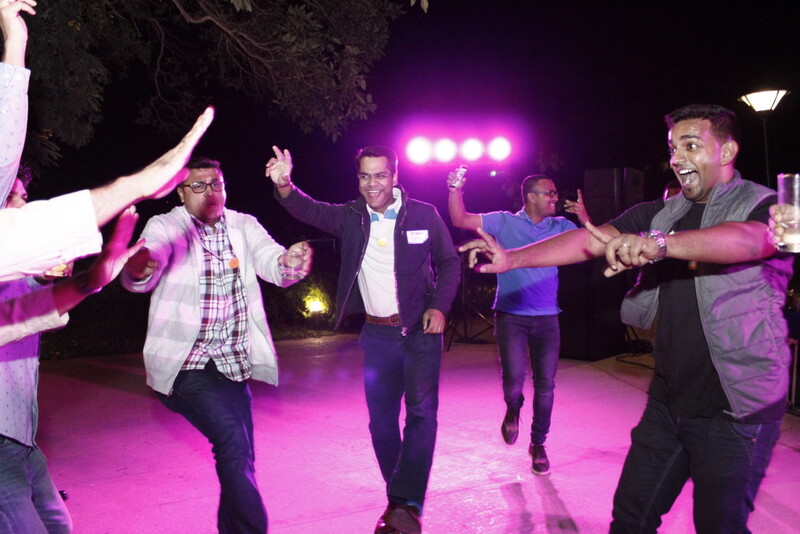 What made these young guys work like men (and women) possessed is the specialty of the Freshdesk culture. Not much detail can be revealed, as we have to respect the fact that Freshdesk is a funded company. But what Girish said at cocktail was taut: “When I am on stage, if some guy thinks if he can do it, I can also do it, I am happy about it” It is suffice to say those who were at the hall were pumped with inspiration by Girish to think big and if you need that, you have to make it to SaaSx. See you there! The April sun wasn’t evident at the beach side locale, near the historic town of Mamallapuram, which hold relics of exceptional beauty on its rocks sculpted under the patronage of the Pallava kings. Had it been the early part of last century, in all probability, we could have reached this place in passenger boats sailing through the Buckingham Canal, now condemned to history. It was using this canal route that the national poet Subramanya Bharatiar escaped to Pondicherry to prevent an imminent arrest by the British to endow us with memorable literary gifts in Tamil. By favourable alignment of choicest factors, Chennai is home to successful SaaS enterprises. To say SaaS is the preserve of Chennai is surely an overstatement. To put it in perspective, it is a worldwide phenomenon and Chennai has made a mark in India. Undoubtedly, the success of Girish Mathrubootham (Freshdesk) has a lot to do with Chennai hailed as the SaaS capital of India, with Suresh Sambandam (KissFlow), Sanjay Parthasarathy (Indix), Krish Subramanian (Chargebee) and Lux (Unmetric) in the elite SaaS league giving an aura to Chennai, not to forget that it was Zoho that made it to the big SaaS league, taking on Salesforce, from Chennai. 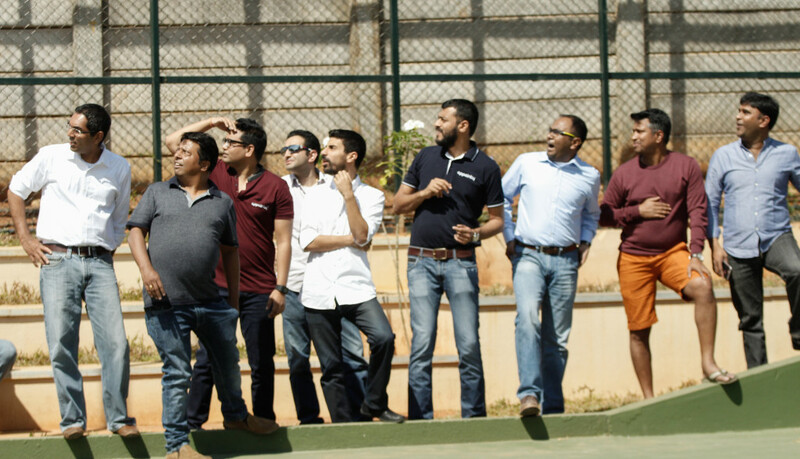 At SaaSx3 it was a day filled with peer-to-peer learning, some fun, and a super-duper end. Playbook roundtables, One Thing Series, Product Teardown, and a presentation of “superscaling” (my term!) by Girish as the grand finale completed the agenda. 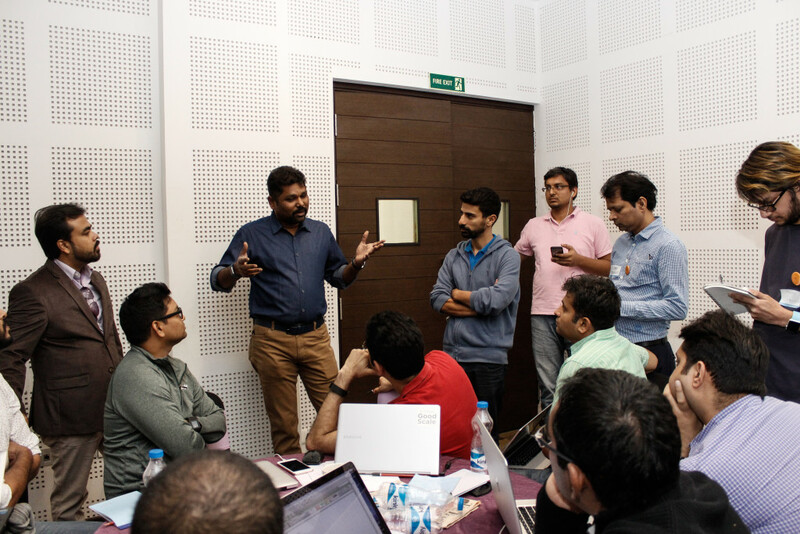 Pallav Nadhani of Fusion Charts and Krish Subramanian of Chargebee (in partnership with Suresh Sambandam of KissFlow) engaged select SaaS startups on a roundtable each. iSPIRT’s agenda of peer-to-peer learning and networking, with the intention of forming a vibrant community of product entrepreneurs, took the form of playbook roundtables where the successful entrepreneurs share the secret of their product success with the product startups. The focus of both the roundtables, where I spent some time in each, was on the product. While Krish focused on taking the product from 0 to $1 million, Pallav chose the marketing as a tool for product’s success. 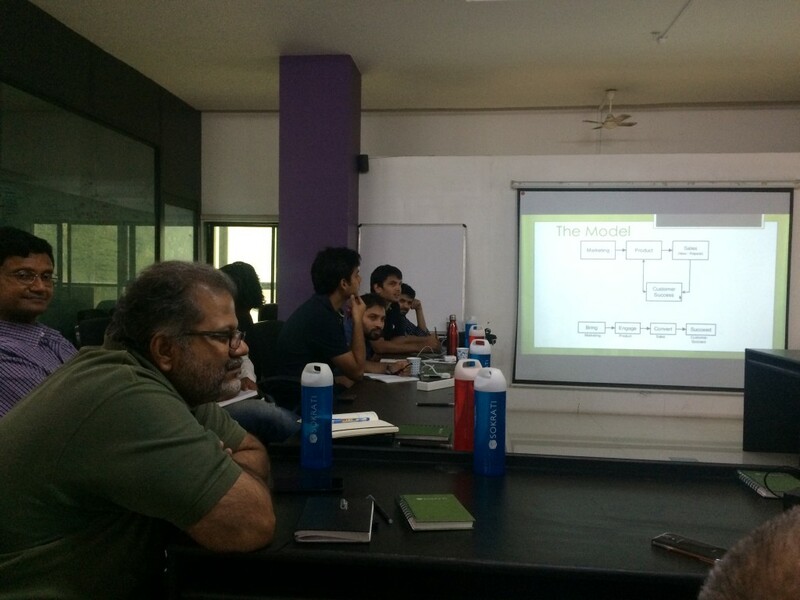 Krish spent a considerable time in explaining the key to product success – understanding the persona of the buyer. “Product-market fit is constantly evolving,” he said. The process doesn’t stop with customer acquisition and onboarding but continues with retention of the customer, on what is now called the customer success. Acquiring the customer is a tedious process for which several methods and processes come in handy. The important take-away from this session was understanding the customer’s intent to buy the product. Krish liberally quoted from Chargebee’s experience to explain his perspective – their assumption of why the customer bought Chargebee flipped on its head when they saw the real data on why they did. How to find out? It is best to ask – first through a non-intrusive e-mail followed up by conversations and further e-mail exchanges. The whole point of the discussion hovered around the 10% conversion rate – of prospects into buyers. But Suresh clarified that it is a benchmark for large enterprises, but the real numbers that convert is the key rather than the percentage if the customers are SMBs. Krish said that the choice between free trial vs freemium is loaded in favour of freemium. But what usually happens is that the free trial users pump up the numbers (the customer count) but largely the free trial customers don’t turn buyers. The truth is freemium works well but free trial also works. The real answer is it all depends on the product. What also works is adding a “powered by *product logo*.” This has worked WebEngage and Freshdesk. WebEngage had a “powered by *logo*” on its product design (for a cheaper priced version) so that it gets more prospects into the funnel. If the customer is not paying, at least he can be used as a channel for prospecting. Freshdesk used the “powered by *logo*” on all its customer support e-mails (which is actually generated by Freshdesk) sent by the free user in its forever free product. Another important aspect touched upon was making the pricing transparent and known, especially if the target customers are SMBs in the case of self-servicing SaaS products. If the customer base is large enterprises, the price conversation can happen offline and it is not necessary to provide price information on the website. When I entered the conversation, Pallav was focusing on why, how and what of the product. He defined customer cohorts as influencers, buyers and users. Pallav’s proposition was a lot deeper – a good product markets itself. But you also ask deeper questions – even the reason why you (your product) exist to answer the other defining aspects of why the product sells (Pallav’s recommendation: view Simon Sinek’s Golden Circle video on why, how, what). The why exists converts simply into what problem is the product solving. But identifying the customer is a continuous evaluation process. Only if you know why you exist can you target the most appropriate buyers for your product so that your solution is aligned to their needs. For targeting customers at the right time, you must understand the customer behaviour a bit deeply. Pallav gave examples of how customer habits can be known from data. His marketing pitch was a bit philosophical quoting Seth Godin, who said, “The valuable forms of marketing are consumed voluntarily” (read Three Changes of Marketing). The network effect is powerful, as Avilesh Singh of WebEngage explained using his product marketing strategy. He said how changing his focus from marketing execs to developers as customers reaped rich dividends. But, beyond all this, remember the most essential aspect is the product itself, which should be flawless from the customer experience point of view. Then other aspects are built on top of it. Setting up your headquarters in the US and a subsidiary in India is a tested model. Here’s a blog post by Girish Mathrubootham – founder of Freshdesk, very clearly articulating the process. Well then, what’s this all about? The setup we follow at Kissflow is the model in reverse. Kissflow is headquartered in India, with a subsidiary in the US. I couldn’t find much information on this model, and thought this might be something worth considering as an option for lots of startups that operate from India. This is not a post on the pros and cons of setting up your headquarters in the USA. That is a complex question and calls for another blog by itself. This model gives you the option to retain the Intellectual Property (IP) outside of USA and still take advantage of the flexibility that comes with having a US Delaware C-Corp entity. Also, you will be paying income taxes in line with income in both the countries. In the other model where the HQ is in the US and the subsidiary in India, you may set up the subsidiary as a service company with a transfer pricing model that requires you to have a profit margin of 12% to 15% in line with the services industry. And you will be paying 30% taxes, in the case of India, on that “perceived profit”. So, here is an alternate model for your consideration that is compliant with the laws of the land in both the countries of operation. 1. Incorporating in USA as a Delaware, C-Corp.
You don’t have to be present in the USA for the incorporation. Instead, you can use one of the many service providers. The cost for this would be approximately $1000, but you can pick and choose packages depending on the services you would require. I would highly recommend that you complete the entire documentation at a stretch including the formation documents, share allocation, etc. This is similar to the Social Security Number. Each business has a unique tax ID number called Employer Identification Number that you will have to register for. Ask for this service to be included as part of your incorporation, or, with your legal firm’s guidance complete this step immediately. Having an EIN is essential to deal with banks and pretty much everything else in the USA. To receive business documents, it is mandatory that you have a US Address. You can use a service like virtualpostmail.com which starts at $20 each month to collect the receipt of letters via emails; they scan and upload documents for your review and also ship them to any part of the world, if required, for an additional cost. Besides this utility, it also serves as your local billing address for your credit/debit cards, etc., which becomes essential when you start paying for services with a US bank account. We use Regus for this service. They provide a bunch of secretarial services including physical mail scanning and emailing among others. You can choose a package that is appropriate for your business. It is very important for your finance/admin team in India to know if there are any statutory mails from the government, bank, etc. and a service like Regus helps you achieve that. You would require a bank that allows remote processing of account opening and operations. We use the services of Chase Bank. Silicon Valley Bank (svb.com) is also an alternative, but requires a reference and a minimum balance of 25k USD. Chase Bank doesn’t have any minimum balance requirement. Before applying for a bank account, it’s mandatory you have an EIN. Apply for a Stripe or Braintree account. The fee may be on the higher side, but the increased transparency in pricing, support, and the ease of doing business with them makes up for it. It is harder to get a regular business credit card without building a credit history. You can use the debit card for all transactions to start with, until you have enough money in bank to get a secure credit card. A secure credit card is nothing but a credit card with a spend limit secured by the money in your bank account / deposit. You can get a toll free number from any of the service providers like phone.com, Google Voice, or Skype. That was a quick checklist of things you need to get started with the US company. Make your US company the exclusive worldwide master distributor of your SaaS product. Set up a distributor license agreement that assigns an exclusive license to the US company, to host and sell your products in the USA. The Indian entity now holds the entire Intellectual Property (IP), by providing a hosting and distribution license to US companies for a 20% price cut per customer. If you look at it, 20% margin is a fair market value even if you had to engage a third party for this service. Also, the US company has to cover all its expenses related to hosting, sales & marketing, and other operations. The terms of service of your website and product has to be owned by the US entity, as a distributor of your software. Preferably, all the legal recourse should be made available with your US entity. You can retain 20% of the revenue earned by the US entity and transfer 80% of the revenue back to your parent company as license fee. When you start making enough money, you will be liable to pay taxes on the profit made on the 20% margin after all the operational costs are subtracted. Note that you will be paying other taxes such as franchise tax, State tax, etc., which have to be paid anyway to operate a company regardless of whether or not you make profits. Statutory warning: As mentioned earlier, do not consider this as legal advice. Just sharing an alternate model than following the traditional model of US HQ. You should definitely consult a lawyer and an accountant to ensure that you stay compliant with all the laws in all the countries that you operate in. Good luck with your startup and feel free to drop a note to suresh-at-kissflow.com to say “Hello”. This blog was first published on the ChargeBee blog. Pune… the city of life. It’s a place you can easily fall in love with. Fun loving yet grounded folks who talk sense. Light drizzle, clean roads and a young city full of aspiring students who want to change the world. So when Product Nation announced it Playtable in Pune I latched on to the opportunity. Avinash and his iSPIRT team have been doing some wonderful work over the years in leading the way for SaaS startups. The topic itself was close to my heart ” Nuts and bolts of selling to US market for B2B SaaS companies” and when you have the ‘Google of B2B SaaS marketing’ Suresh Sambandam conducting it, you don’t want to let it go. Google coz if you have a query he has the right answer. Over the years Suresh has done some real hardwork in taking Kissflow to 10000+ customers and he has fixed all those nuances of SaaS selling by getting into depth of it. So on a pleasant Saturday morning , 30th May to be precise, we a bunch of 15 entrepreneurs and few aspiring ones gathered to know how to make it BIG by earning in dollars. United States is by far the biggest market for SaaS companies and if you get it right there you will make it BIG one day. We started with basic introductions and brief product details. It’s really heartening to see how enterprising the current generation is. We guys today are proud to be entrepreneurs or employees of startups. It shows you can take risks, think outside the box and are not satisfied with status quo. I can surely see that the next gen of aspiring entrepreneurs will come from those who work with startups. And why not. If you can make a startup successful, you surely can build one for yourself. Our workshop focused on B2B SaaS startups. How can you sell your B2B product to US customers sitting out of India? Yes, selling to them without even meeting them. B2B selling has traditionally been about relationships, face to face meetings, getting to know your customers, value selling and all. But, cloud computing has totally disrupted the market. In fact it has expanded the IT market globally. Today millions of SMB and mid market clients can afford to automate their marketing, sales, operations etc using cloud solutions on SaaS model. And if your product can add value to their business they care a damn as to where you are based. I think we should thank the first generation B2B SaaS Startups like Zoho, Freshdesk, Kissflow, Druva etc who have built the trust and confidence in US customers that world class solutions can be delivered from India. We the 2nd generation now need to ensure that put our best foot forward in terms of quality of product and support when we reach out to them. To understand the process best we looked at it in a logical flow. The group agreed that a combination of 2 and 3 would be ideal to reach the right set of customers. Being a category creator – someone who creates a new market needs a lot of investment and F2F interaction. But low cost should not be confused with cheap. We need to build solutions with world class quality at minimal cost thereby passing the benefits to the customers. That creates high value product for them. Next comes the market definition. Suresh shared the segmentation based on number of employees into SOHO(1-10), VSMB(10-50),SMB(50-500),mid market (500-5000) and enterprise (5000+). The sweet spot for SaaS marketing lies in the SMB and mid market space. In terms of who decides on buying your product, in SMB whosoever may be evaluating, the founder or owner will somewhere get involved before the purchase. As we move towards mid market and then enterprise customers, the line of business (LOB) guys have a larger influence apart from IT team who might get involved. Also which geography to target and what languages to support. US and English are big enough to start and one should look at other countries probably in growth phase. SaaS startups should focus on ONE Country, ONE language first to ensure they remain focused. While the nitty gritty may vary by the type of solution, the role of marketing is to get people to sign up for a trial or free account. 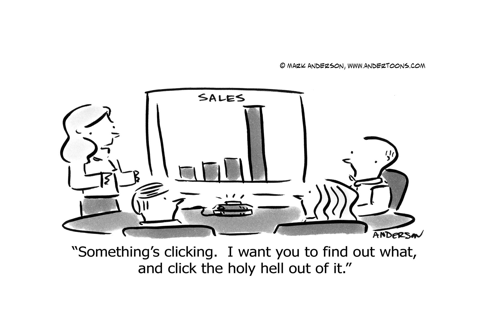 Unlike B2C , in B2B the customer has to see the product demo. This is where the product team steps in to ensure the solution and get the customer engaged and use your product during trial period. If the customer is not using your product during trial, he probably won’t buy it. Once the product team ensures a good product experience, the sales team steps in to ensure conversion. Sales team can dived into ‘hunters’ – ones who get the customers and ‘farmers’ ones who nurture the relationship to upsell and cross sell. The customer success team ensures that the customers realise value from your solution. The metrics and handover points for each team needs to be meticulously set and communicated. The support queries from customers during early days of engagement should come to sales team and not support team as it is an opportunity for you to grow the relationship. But seller should get the issue fixed first and then engage further. We discussed the marketing process in detail including SEO and Adwords, social media, content marketing, blogging. The importance of google and the traffic it generates is immense so SEO and Adwords are an important piece but the two need different specialised roles. The role of marketing is to get enough leads digitally. These can be through organic search- Google, Yahoo, Bing etc). While google still dominates the majority of the US market, those targeting elderly citizens might want to reach out via Bing as they still have a lot of elderly crowd there. SEO requires identifying your keywords as per the target geography and product. It needs meticulous tracking of keyword ranking every 2 weeks. Fact is if you are not on FIRST page of google, its not worth. Till you get enough of organic crowd in, AdWords can fill in. Adwords is all about number crunching and reaching to an optimum cost per lead. Ashish and his Sokrati team shared their insights on managing adwords as that’s their area of specialisation and promised to conduct a detailed session later some time. Suresh shared insights into digital ROI metrics for AdWords. On an average you can get a signup for $10-$25 for search ads and $2-$10 for display ads. However the conversion seems better for search ads as these are real customers searching for specific requirements whereas in display ads are shown on sites which might have these customers as one of their target audience. We discussed social media marketing – LinkedIn and Twitter and content marketing (blogging, case study creation etc) in detail. The group shared its experiences on getting leads from Quora and forum discussions. The internet now days is getting really crowded so you need to figure out which group is giving you the returns rather than spraying your messages across all over. Content marketing can be a differentiator in this crowded digital world- the quality not the quantity matters there. Suresh shared how his team publish two customer experience blogs every week where they share live feedbacks from actual customers. Retargeting helps you bring the same vistors back to your site and improve the ROI on your existing marketing spends. While content creation is important, content publishing is as much an important task. We discussed tools like Outbrain and Taboola for content distribution. Talking of tools, the groups discussed a host of SaaS tools that can be used by startups to more efficient like Pipedrive, ChargeBee, Intercom, Mixpanel, Google Analytics etc. Suresh shared his 10-80-10 principle for creating quality content. If total expected time for writing a piece of content is 100, spend 10 on briefing the content writer in the beginning, let them write for next 80- spend 10 on final review. The fact is the best content writers wont be able to understand your solution and market to the extent you do. So a 10 % briefing time can save them a lot effort and set them in the right direction. We discussed the important aspect of pricing which also brought us to the discussion on Freemium Vs Free Trial. Majority of the group went in favour of Free trial over Freemium as they felt that the customers didn’t see value in fremium. While there is no thumb rule for this, solutions where SaaS products can get self signup can still look at Freemium to upgrade them later. On pricing, different team members shared their views on their basis of pricing. Some did it bottoms up on cost plus model where as others looked at the competitive pricing. Pricing is an important aspect so ensure you keep taking feedback from your early customers and incorporate that feedback. Finally, the most important aspect of execution is measuring the key metrics. As your team grows you need to push a dashboard of metrics which alert you on any activites that are going offtrack or to scale up things. Conversion Ratio, Conversion through Paid vs Organic, Organic Traffic by Source, Signup Trend Paid vs Organic vs Source,Paid traffic by Source, CPS for Paid and Overall, A-ARPA trend 12 months, etc are some of the important metrics. Product Nation RT on Selling SaaS product to US – Priceless ! Kudos to Avinash for oranising, Sokrati team for being a great host and Suresh for conducting the round table. At 49 not out, half century is round the corner for Product Nation round tables and I’m sure in for a long innings. As long as they bat with us, we are sure to win in the end ! Suresh Sambandam, Founder and CEO of OrangeScape (the company behind KissFlow), in collaboration with the iSPIRT team, conducted the 49th #PlayBookRT on building SaaS products for the world. Sokrati (Pune) played a gracious host for this event, and saw around 14 product entrepreneurs from different cities. Avinash Raghava introduced Suresh and the RT was kicked off with a round of introduction from all the participants. Suresh laid out the purpose of the round table and defined the scope. This PlayBookRT was for the B2B SaaS startups with a product that has a global audience. These companies have achieved a product-market fit with a MRR (Monthly Recurring Revenue) in the range of $1K to $5K. These companies are looking to move the needle to $50K-$100K MRR. Essentially, early startups that are looking to grow at least 110x. Depending on your product, you may segment the customers by their revenues. It is unlikely that your product will work across all segments as it is. The sweet spot for KissFlow is the SMB and Mid Market, as the value proposition is stronger for these customers. You have to pick your own sweet spot. There was some discussion on why Enterprise segment is different from the others. There were multiple views on that. It was discussed that the marketing and sales processes are different for large customers. Their buying process is different too. They want “vendors” to come to them. Often, the product itself doesn’t work. Example – for KissFlow, Enterprise’s would need integration with their existing systems like SAP or Oracle. The SMB or Mid-Market customers do not have such requirements. For enterprises, you may have to package your product as a custom solution. Instead of the entire company, you may find it easier to get your product rolled out in a specific department. The Mid-Market segment opens a big opportunity in US market. Typically, in the US, $5,000 is the approval limit in this segment. Most of the SaaS products fit in this limit. That makes decision making easier and fast. These companies are willing to spend money on products that help them compete with big guys. The discussion then moved on to the core elements of a successful SaaS business. The role of the product in SaaS is very high. For enterprise products, the product comes at the end of the sales cycle. For SaaS products, the opposite is true. So, your product has to solve a problem. While product is at the core of your business, marketing comes before the product. Your marketing communication needs to match the product promise. Before accelerating your marketing, you need to decide on the product positioning. Your product is either a category creator, or provides a novel approach to an existing and well-understood category, or low cost alternative. Often, most of the SaaS businesses will fall in the second or third category. It’s also possible that product positioning could be mix of last two categories. The category creator products are hardest to pull off. The low-cost alternative need not be a low-priced alternative. Being in India, we can enjoy the advantage of low cost structures. Some companies do pass on the cost benefits to the customer via low price. While offering a low price option, it is important to ensure that you are not perceived as a low-quality option. The next topic of discussion was offering a Freemium product vs Free trial. Often, for SaaS, this choice does not depend on the cost. The general consensus seemed to emerge that a free trial is the best option. Even if it doesn’t cost you much to offer part of the product for free, the effort to convert that free user to being a ‘paid’ user is high. Plus, when the user is ready to pay for the product, the user still may go out to look for other options. There are “free” products that make you pay with say a link to their website. This is not really free as your customers are paying with a different currency. Like all discussions, this one too took a detour and we discussed about sales for the global customer base. To serve the US market, you need to have a night shift. For KissFlow, the newly signed up customer receives two emails – one automated and one personal email. The automated email is to schedule a demo of the product. KISSFlow has reduced the friction to sign up dramatically. You sign up with just an email. They have a team to find out information about that person based on the email address. All the new leads get assigned to the sales team automatically based on timezones and available bandwidth with the sales team. Each sales person handles about 200 leads per month with an annual contract value of less than $5,000. The next topic of discuss was pricing. People visit the homepage and then the ‘pricing’ page. They are qualifying themselves by looking at pricing. There are various ways to price your product. For the well-established category, competition will be a huge influencer in your pricing. You can also price your product based on value offered, though, you need to clearly demonstrate the value of the product. For KissFlow, the anchor was Google Apps. At the start, they focused on a niche of companies who have adopted Google Apps, which costs $5 per user per month. So, they picked the price of $3 per month. For SaaS companies, raising the prices is usually not a problem. You can grandfather your existing customers who will continue to enjoy the same price, but the newer customers will pay a higher price. The real problem is lowering the prices, as it upsets existing customers. If your customers are not complaining about the prices, you are leaving money on the table and you should raise the price. You should make users pay every month irrespective of their usage. You shouldn’t have to sell your product every month to the customers. That’s why your customers need to keep paying every month. Setting the expectations also ensures that customers are not thinking about pricing often. Marketing was the next topic of discussion. Your website is a core marketing asset. You should avoid outsourcing the site development and have an in-house team for updating and maintaining the website. Your home page should have a crisp headline with some value proposition. Jargon should be avoided. Make it easy for customers to understand and take a decision about your product. You should create a “customers” page for social proof. Highlight your major customers on this page. If you are running a blog, it will have visitors who are not aware about your product. You should create ads for your own product and run them on your blog. You can use SEO and AdWords to bring the organic and paid traffic. SEO needs a lot of time to ramp up. So, start early with a dedicated team, even if it is a one-person team. AdWords needs a specialist to handle the paid traffic. Here, you can define your key metrics like costs per sign up. AdWords can deliver a sign up at $10-$25 for search and $2-$10 for display ads. These are only sign ups and not conversions. You need to measure conversion to paid subscription. That would be your true cost of customer acquisition. You need to have a responsive site as mobile traffic is growing. Even though most business users will sign up for your product with a desktop, they might discover your product on the mobile (maybe while reading a blog). They need to have a good experience when they are on mobile. You can run re-marketing ads. This will provide you multiple opportunities to reach out to the user. Test out different messaging in the re-targeting. You can do smarter remarketing by finding the users’ point of interaction. For paid ads, start with only the US and then keep adding more countries depending on the quality of the traffic. There was a brief discussion on content marketing, focused on the disciplined approach to creating valuable content that will start delivering results over a period of time. This was an excellent round table that covered most of the aspects of building SaaS products for the global market. Contributed by Shashikant Kore, Co-founder of Karooya. While new-age global SaaS startups like Zenefits & Slack continue to grow at a feverish pace, India too is beginning to see the emergence of quality SaaS companies like Practo, Freshdesk and Capillary among others. These companies have attractive unit economics, are capital efficient and have demonstrated the ability to compete in international markets. As a result there is strong investor interest in India SaaS companies. Matrix Partners India, one of the leading venture capital firms in India, has invested in startups such as Practo, Limetray, GrownOut to name a few, which are building scalable businesses with a SaaS delivery model. Davik Skok, General Partner, Matrix Partners, has a wealth of experience running companies. David will share his insights & experience of helping build & scale SaaS businesses. The talk will be followed by a panel discussion on the same theme. Panelists include David Skok, General Partner, Matrix Partners; Shashank ND, co-founder & CEO, Practo, Suresh Sambandam, CEO, KissFlow and Vijay Sharma, co-founder, Belong. If you are a current or aspiring SaaS entrepreneur interested in attending this event, please register here. “Because, until you figure out your sales learning curve, it is you the founder who should go and sell. Only you know the product enough, you know the architecture, so you can take the call easily. A sales head cannot make the commitments that you can, at that point. He should come in only when it is time to scale. These were entrepreneurs talking. There were 40 of them, all running SaaS (software-as-a-service) startups in various stages of the evolutionary ladder. Some just out of college, some pushing the pedal at an accelerator, some experienced enough to invest in other startups themselves. They were all on a bus. From Bangalore to Chennai. To attend a first-of-its-kind meetup organized by a bunch of SaaS entrepreneurs for all SaaS entrepreneurs in India,SaaSx Chennai. That I, a journalist, was embedded on the world’s “SaaSiest bus” – as they called it – didn’t stop any of them from talking about their biggest mistakes or what they learned the rough way. And that was because SaaS was no longer an untamed, strange animal. Each of the entrepreneurs on the bus knew that they were sitting on a good steed. Everybody had a steady tick on revenue. “People call the SaaS business the flywheel business – it takes time for it to build momentum, but when it does, it is very difficult to stop it. This is what is happening now,” Sharad Sharma, co-founder of startup thinktank iSPIRT – the Indian Software Product Industry Roundtable, who is also on the bus, tells me. Sharma is the co-founder and CEO of analytics startup BrandSigma. He is also a prolific angel investor with about two dozen investments. Former CEO of Yahoo India’s research and development wing, Sharma has been in the Indian tech industry since 1986, growing companies, building new ones, and now hand-holding young startups. According to him, today, there are fundamental forces favoring SaaS startups in India. SaaS is often called “on-demand software” because it refers to a subscription-based delivery model, where applications are accessed via the internet. The subscribers do not have the burden of installing, managing, and maintaining hardware or software; they just need a reliable internet connection. The company selling the software will host and maintain the servers, databases, and code that constitute an application. The buyers pay an annual or monthly subscription fee. That’s all. It’s a clear win for companies do not want to invest in expensive hardware to host the software. They can spread out costs over time. And for the sellers, it means predictable recurring revenue, good margins, and inbound marketing. The SaaS movement first picked up pace when Salesforce in San Francisco threw open customer relationship management software for small- and medium-sized companies on a subscription model. This was in 1999. It went public on the New York Stock Exchange in 2004, raising US$110 million, and acquired dozens of other startups later on. Meanwhile, Indian startups too had caught on early. Chennai-based Zoho, founded in 1996, launched its first business app on the cloud – Zoho Writer – in 2005. Since then, the bootstrapped company has created a string of applications for businesses around the world, and grew to a subscribers’ base of over 13 million. Its success inspired many Indian startups to adopt the SaaS model. A good example is customer-support software maker Freshdesk, now one of India’s hottest startups. Founder of Freshdesk Girish Mathrubootham was vice-president for product management at Zoho before he started Freshdesk in 2010. Today, it’s on par with global leaders like Zendesk. Leading software review platform G2 Crowd actually rated it a notch above its American counterpart. Three key factors came together to give Indian startups an edge in SaaS, Sharma says. First is the new pipe of buyers that everybody is selling to: the small and medium businesses of the West. The market is evolved there, and people don’t want to buy anything from a sales person. Why? “Because of the same reason they don’t want to buy cars from a car salesperson. Nobody buys a car from a car salesperson anymore because the next morning, they have buyer’s remorse. They feel they bought a car that they didn’t want, they bought features they didn’t want, and that they were oversold. And now, this is actually the problem in enterprise software. In every big enterprise, you will hear a term called enterprise shelfware – stocks of software, they are not using at all,” Sharma says. So now, companies want to do their own homework to come up with software options and talk to sales folk on the phone, where they will be less likely to be cajoled into buying what they don’t want. And in that case, it doesn’t matter where the software-maker is based, in California or Coimbatore. The desk selling and marketing model of SaaS evened the playing field for everybody. Second is the youth of the market. A few years back, selling on the cloud was just a mere concept. So everybody in this space now, big or small, are startups. There isn’t a Microsoft or an Oracle with a near monopoly in any of the SaaS verticals. For instance, Freshdesk is competing with Zendesk, but Zendesk too is still a startup. “There is no incumbency – nobody has yet cracked the market fully. The market is still open for new players. That changes the odds completely. That is enormously enabling,” Sharma points out, adding that for the first time, Indian companies are not late to the global market. The third star that aligned to make the magic work for Indian startups is the inbound marketing model for SaaS. Traditionally, a company needed a creative person, who will make an emotional ad that will resonate with everyone. But for SaaS startups, marketing is more about tweaking the product with numbers in mind – so it appeals to an engineer. “Today, if you just talk to the people here in the bus, they will tell you that all marketers are also engineers now. They are the same type of people. The new wave of marketing is the scientific marketing; it is not the big idea, it is about making course corrections everyday. So it is very easy for Indian founders to adopt,” Sharma says. Put these three together, and voila! There is an outpouring of SaaS activity in India, although it’s still an undercovered story in both global media and the local mainstream press. Why the SaaSiest bus from Bangalore to Chennai? Bangalore is always the first city to pop up in any conversation about startups in India. But when it comes to SaaS, Chennai has a star line-up – from Zoho to Freshdesk, Indix,ChargeBee, OrangeScape, Unmetric, and so on. 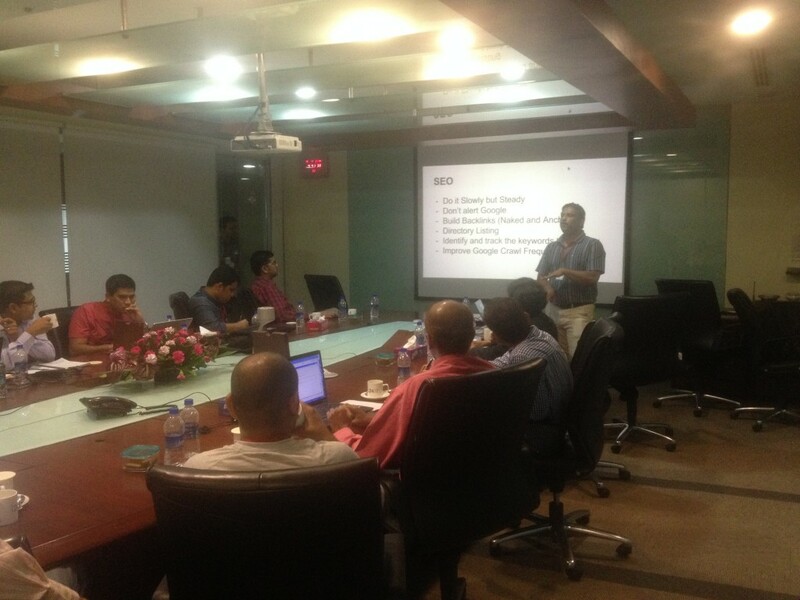 So Bangalore-based iSPIRT decided to hold SaaSx in Chennai and bus a few dozen SaaS founders there from Bangalore. Microsoft Ventures, also based in Bangalore, came in as a co-host. About 120 SaaS entrepreneurs gathered in a conference hall at a swanky hotel in Chennai eager for some peer learning, expert guidance, and bonhomie. Serial entrepreneur Avlesh Singh, co-founder of customer engagement tool WebEngage was among those who shared his “SaaS story” of how he struck upon the core idea, found the product market fit, got the first 100 customers, and pushed the pedal from there to win almost every leading ecommerce company in the world as a client. 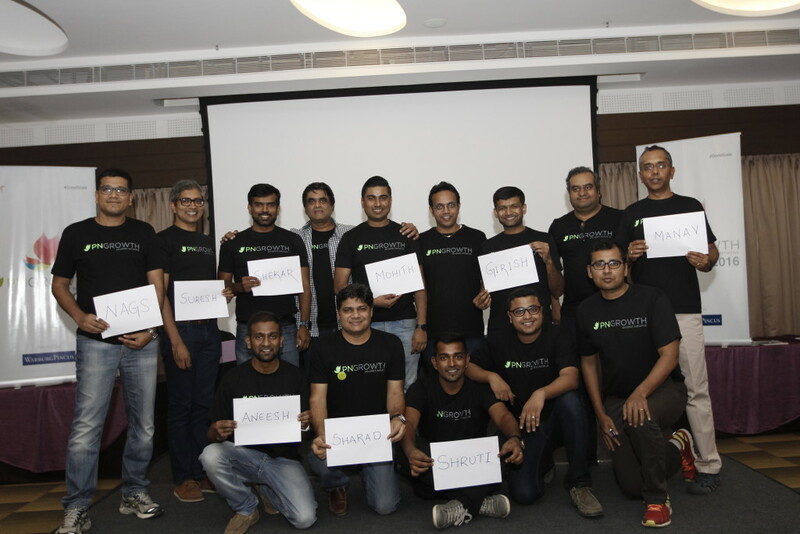 Freshdesk’s Girish Mathrubootham posed questions to the crowd, drew out tips to tackle common hurdles, and answered a few cheeky ones like how his company “poached” a client from its bete noire Zendesk. 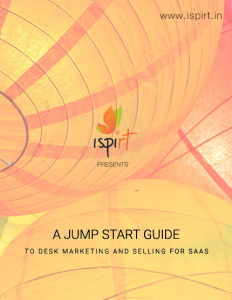 The hosts launched a how-to-sell manual, “Jump Start Guide for Desk Marketing and Selling for SaaS,” based on the insights gleaned over the roundtable meetups iSPIRT had been organizing over the past year. The guide was co-written by Krish Subramaniam, founder of Chargebee, Niraj Ranjan Rout, founder of GrexIt, Sahil Parikh, founder of Brightpod, and Suresh Sambandam, founder of OrangeScape. In India, the SaaS trend has just picked up pace, but already some argue that it is as big as the IT services trend of the early 1990s. The outsourcing market was just opening then, and though there were biggies like Accenture, IBM, and HP in it already, Indian companies like Infosys disrupted their business model. Now, the SaaS startups in the country are taking to the desk selling and marketing model with great gusto, disrupting this space. Currently, India’s main competitors are Australia and New Zealand among emerging SaaS hubs. Sharma points out a way to evaluate this space, where companies have started to go public already. For example, customer support startup Zendesk went public last year. Out of the six competitors that Zendesk listed in their public IPO document, four are Indian companies: Kayako Helpdesk Pvt. Ltd., Freshdesk, Inc., SupportBee, Inc., and Tenmiles Technologies Pvt. Ltd (Happy Fox). Now, there are about 34 SaaS startups in the US touted as IPO material in the coming four years. “Each one of them has Indian companies as their significant competitors, nibbling at their meals, trying to disrupt them. Now think of it. If that doesn’t tell you that India is arriving on the SaaS market, then nothing will,” Sharma says. Looking around me at a busload of SaaSy entrepreneurs, I’m convinced. InTech50 2015 (a flagship event of iSPIRT & Terenne Global) is happy to announce the fourth batch of 10 finalists. Congratulations to all the following finalists…listed alphabetically. The first, second and third batch of 10 companies has been announced before. Accelpro Technology – transforming better technology ideas into business growth and better economies while addressing the much-needed requirement for faster secure remote access solution. AccelPro delivers Next Generation of SSL VPN solution, which has revolutionized mobility VPN market. DataWeave – delivers real time actionable retail insights to you with its extensive feature set. Millions of products related data points curated across categories, geographies, and languages. Drishti Soft-Solutions – Ameyo is a pioneering, all-in-one communication suite from Drishti. A multi-channel and multi-modal communication solution, Ameyo can be integrated easily in centralized and distributed (multi-site) contact centers and improves efficiency and productivity. DeepBiz – ICareU is an innovative cloud platform to provide an end-to-end Usage Based Insurance Solution to an Indian Motor Insurance Companies to adopt and implement a cost effective Insurance service to their customers. GoDB Tech – GoDB’s Mobility platform is a comprehensive Mobile Enterprise Application Platform (MEAP) that enables enterprises to extend their business processes outside their corporate walls. InspireOne – We help companies convert their human potential to organizational capability, through comprehensive solutions in the areas of Leadership Development, Sales Management, Productivity Enhancement, and Organizational Change. Ilantus – IDaaS express is cloud based Identity and Access Management product which offers enterprises the ability to address all Identity and Access Management business challenges, such as user provisioning, access governance, password management, single sign-on, federation, security intelligence and BYOD security – without any need for costly and complex on-premise infrastructure. Kissflow – Built as a self-service cloud workflow software, KiSSFLOW is ready to use and can be set up in minutes as against traditional business process management software and customized workflow software which requires huge investments and takes days to set up. NanoBi – a simple to use, interactive and visual full-stack platform delivered as subscription software on cloud or on-premise. Nanobi’s shared data platform provides the most unified views in the form of virtual information. Watch this space, as we announce the fifth and final batch shortly. In innumerable brainstorming and “gyan” sessions with friends, mentors and experts, one of the most stressed focus area is getting product market fit as soon as possible and then follow it up with scaling sales. I think most early to mid stage entrepreneurs are instinctively aware of this but struggling with “Hows”. So when I saw this playbook promising precisely to explain how, I grabbed a spot. I wasn’t disappointed. Suresh Sambandam is very down to earth and spoke earnestly and in detail about different steps he took while selling the OrangeScape’s product KiSSFLOW. Attendees who themselves run early to mid-stage companies and Kishore Mandyam of Impel CRM chipped in with their stories and inputs. Here is the detailed enough capture of the same. The relevancy of this session is greatest to Early and Mid-stage entrepreneurs going from $0-5K MRR to $50K MRR selling to US MSB. This session is NOT meant for discovery or product market fit but I have inserted the discussion at the end. The blog is organised as below Product Market Fit / Pricing as step 0; Followed by Inbound Sales and Marketing and then finally Outbound Sales and discussion on tools. The absolute first step (may be zeroth step) in Sales process is getting the product market fit. You know you have a Product Market Fit with a B2B Mid-Market SaaS product when unknown folks start buying (Inbound sales is picking up traction). Unfortunately in cases that were presented at the session, the discovery process of the product happened organically based on another product that they were building. However the generic solution for early stage product discovery goes like this. Create a landing page with a “notify when ready”. Once people signup engage with them and partner with them to fine tune the product. To put succinctly Bring-> Engage->Convert->Succeed; As you can clearly see from this model, “Marketing Comes Before Product” or as Suresh puts it bring the horse to the water. So which model suits best for a SaaS product? Is there one preferable over another? Very subjective topic but the thumb rule seems to be for SMB / Mid-market SaaS Free Trial is a best method to go. Models aside, what matters most to the conversion is the post-signup engagement and the price factor. Faster conversions are dependent on many factors but one of the key factors is pricing. If pricing is within the decision-making authority of the midlevel managers, it is easier to convert. The discretionary spending seems to be around about USD 5K. Keeping the price low per user and making minimum unit purchase of say 10 users per bundle works quite great. WebSite – Suresh firmly believes that Website is a core asset for a B2B SaaS company and hence should not be outsourced. He advises to have a minimum team of Web Developer, Creative Designer and Automation Engineer. This would help perpetual A/B testing in short cycles.. Couple of nifty tricks to make the whole experience frictionless is to have a one click signup. Visitor should be able to experience the main software within few seconds. The other participating companies in the round table have used various techniques to authenticate emails like SMTP Ping, email pattern matching, etc. It is also important to closely monitor the users interaction with the website, capture it and feed it back to the Engineers to close the gap and arguments between Sales/Marketing and Engineering. One of the recommended tools in this category is FullStory. While it is important to have this come from founders, it is very hard to find time for the founders. One technique employed by KiSSFLOW is to hire fresher from visual communication background who has a grammar nazi attitude and give a very specific target like 2 +2+2+1 per week (2 blogs published 2 interviews done, 2 assured interviews for next week and 1 research post). He also uses 10-80-10 formula for the content itself where beginning 10 and ending 10 percent are reviewed in detail by founders. One of the other key points stressed was to have self ads in each of the content which leads to signup. Obviously the most critical first step here is having a database of all the companies and the decision makers that you want to reach out. Linkedin Premium works best. This is how Suresh does it. He uses Linkedin DB to create a list of all target companies and then assigns the task of creating the contact details to an online consultant who was discovered on Elance. It usually works out to INR6-INR10 per contact. There are other dbs one can purchase directly from companies such as Data.com, Discover, rainking and slew of others. Once contacts are obtained it is very important to use direct emails as opposed to using mailchimp, constantcontact, etc as most of them will not land in inbox. It also helps to be as personalized as possible. It is absolutely essential for the founder to set the tone of sales. For US be ready to pull night shifts continuously. Although it is the founders calling, it is good idea to assume the persona that appeals to US clients say Bob and position one as a sales manager. It is also important to make the sales hire to listen to the call handling to build on this. Not all channels are suitable for SaaS and one needs to do some trial and error to figure out the best channels. The channels include Events, Road Shows, Reselling Partners and Referral/Affiliate partners, may work well but Orangescape has ignored them. Meticulous tracking is critical and many tools are available to manage and measure the process. Some that are being used by the roundtable companies are listed below. Very hard to summarize such a detailed session, but one parting thought stands out. Attention to details followed by automation and customization seems to be the way to go.